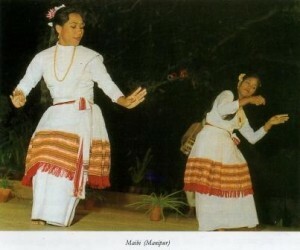 The trance dance of maibi of Manipur in connection with the Lai Haroba festival is totally different as it is not only very graceful but aesthetically satisfying also. Maibis are a class of priestesses. Anyone can not be a maibi unless she shows definite signs of being spiritually predisposed. She may show the signs of spiritual predisposition at a tender age or when she is an adult. She is then selected to be a maibi and lead the rest of her life the way prescribed for a maibi. The maibi dance begins from the kneeling position. Very slowly she rises holding die knees always close. She holds both her hands near the navel with both thumbs and forefingers touching each other. Between the forefinger and middle finger she holds a leaf of a sacred plant. The dance movements are all slow, controlled, and lyrical. Right from the beginning of the dance the maibi is in trance. Slowly rising while moving like a spiral when she comes to the erect position, with controlled and elegant stepping she moves like the figure of eight which symbolizes the Nagamandala, the Tantrik yantra. Although it is a dance in trance the aesthetic quality is no less than any classical dancing.